Eyewitness Jacob Stevens, 18, hugs his mother Tammi Stevens after being interviewed by police following Friday’s horrific shooting inside a Colorado movie theater. The gunman, 24-year-old James Holmes, was arrested at the scene. AURORA, Colorado (TRP) – As investigators begin to piece together the events that led to the horrific shooting inside a Colorado movie theater where a deranged gunman wounded a total of 71 people, killing 12, during a midnight showing of the Batman movie, several stories in connection to the tragedy have emerged across the web. The gunman, identified as 24-year-old James Holmes, donned a gas mask when he entered the crowded Aurora movie theater shortly after midnight Friday where authorities say he hurled a gas canister and then proceeded to open fire on the crowd. At first, moviegoers thought the stunt was part of promotion behind “The Dark Knight Rises” — one of the most highly anticipated films of the summer — but it ended as one of the deadliest mass shootings in recent U.S. history. This Reddit item posted by a shooting victim, detailing his injuries, immediately flew to the top of the site’s homepage thread. Meanwhile, several theater goers on the scene started uploading videos to YouTube, capturing the horrific episode as it unfolded. One of the more prominent videos that went viral by mid-day Friday documented the chaos and utter confusion experienced by many outside the theater as shooting victims were carried out. The video clocked in over a million views just 6 hours after its initial posting. For a good part of the day, stories in connection to the tragedy dominated Twitter’s trending topics, including the hashtags #theatershooting and #Aurora. Among the tweets that went viral were two which sparked both outrage and controversy from the Twitterverse. Earlier in the day, the American Rifleman, the self-described “official journal of the National Rifle Association” sent out a tweet wishing a Happy Friday to “shooters,” asking them about their weekend plans. The tweet was later taken down and attributed to “a single individual, unaware of events in Colorado,” the NRA said in a statement. This, while online store Celeb Boutique failed to inquire about the trending topic #Aurora and assumed the topic #Aurora was trending due to sales of their dress which dons the same name. 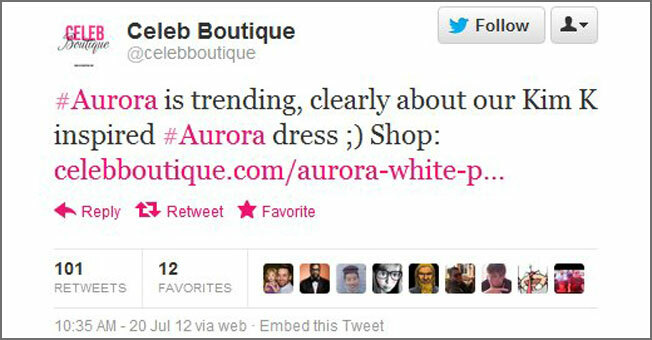 “#Aurora is trending, clearly about our Kim K inspired #Aurora dress ;),” the company tweeted. Followers were quick to retweet the gaffe, lashing out at the self-absorbed, ignorant PR team representing the company. The tweet was later deleted. It also didn’t take long for the internet-hoax machine to get in on the action. 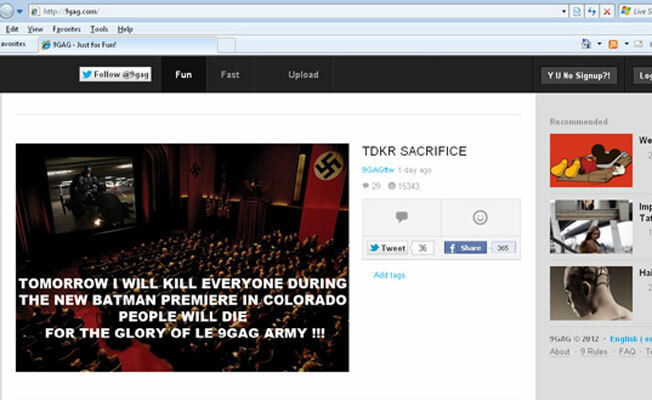 Rumors grew rampant on several social networking sites hours after the shooting, suggesting the gunman James Holmes was encouraged by users on imageboard site 9gag to plan and execute the shooting. Screenshots of the site which included a disturbing meme (below), surfaced all over the web in an attempt to prove the notion, but it was later determined that both were Photoshopped, and it was indeed a hoax.